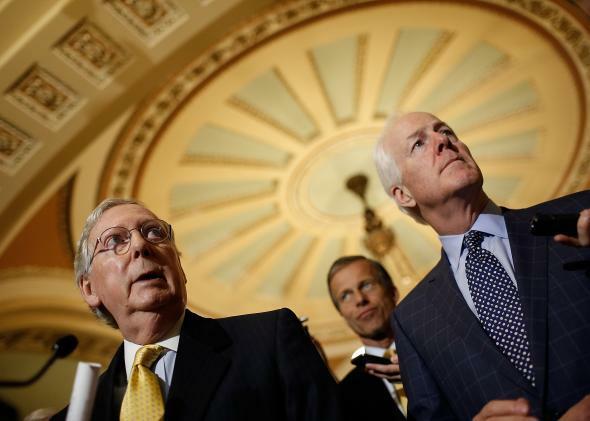 Iran bill: Senate approves measure allowing lawmakers to weigh in on nuclear deal with Iran. Senate Majority Leader Mitch McConnell (L) answers questions from reporters about the Iran bill at the U.S. Capitol on Tuesday. The Senate voted 98-1 on Thursday to give Congress some control over a potential nuclear deal between the United States and Iran, the New York Times reports. The Iran Nuclear Agreement Review Act of 2015 would allow lawmakers to vote on approval to lift congressional sanctions on Iran and require the president to certify to Congress every six months that Iran is in compliance with the terms of the deal. Sen. Tom Cotton, who in March authored a controversial letter to the Iranian government that was widely seen as an attempt to undermine the White House’s ongoing negotiations with Iran, cast the lone vote in opposition to the bill. The bipartisan vote comes after inter-party squabbles among Republicans derailed planned debates on amendments to the bill. Florida Sen. Marco Rubio, a candidate for the GOP presidential nomination, told the Times he was “deeply disappointed” that he wouldn’t get a vote on his amendment that would force Iran to recognize Israel as a state. Urging his colleagues to move past their objections and support the measure, Majority Leader Mitch McConnell said on the Senate floor that the bill was “not the end of the story” and was preferable to the alternative of inaction, which would “give the American people no say at all” in negotiations with Iran, according to the Times. Much of the turbulence over the bill’s passage came when Republican Sen. David Vitter of Louisiana, railing against the process that kept amendments from reaching the floor, attempted to stall the bill on Wednesday. Vitter ultimately voted in favor of the bill on Thursday. A nuclear-arms agreement with any adversary—especially the terror-sponsoring, Islamist Iranian regime—should be submitted as a treaty and obtain a two-thirds majority vote in the Senate as required by the Constitution. President Obama wants to reverse this rule, requiring opponents to get a two-thirds vote to stop his dangerous deal. But Congress should not accept this usurpation, nor allow the president any grounds to claim that Congress blessed his nuclear deal. I will work with Republicans and Democrats to stop a dangerous deal that would put Iran on the path to obtaining a nuclear weapon. Our goal is to stop a bad agreement that could pave the way to a nuclear-armed Iran, set off a regional nuclear arms race, and strengthen and legitimize the government of Iran–which threatens Israel and other allies in the region, as well as supports terrorism throughout the Middle East… I look forward to House passage of this bill to hold President Obama’s administration accountable. The House of Representatives is expected to take up its version of the bill next week.